The Port of Milwaukee's New Branding – Inland Rivers, Ports & Terminals, INC.
New Logo and Name Highlight Milwaukee’s Connection to the World Milwaukee Mayor Tom Barrett publicly shared Port Milwaukee’s new logo Friday morning with the presentation of signs outside the Port’s offices. The new name, logo, and tag line are intended to project a contemporary image that highlights the Port’s role in domestic and international transportation. With its high quality rail service, direct interstate highway access, and regularly scheduled international shipping service via the St. Lawrence Seaway, Port Milwaukee is uniquely positioned to serve the regional economy. “Port Milwaukee adds efficiency, reliability, and flexibility to the transportation system, and we connect businesses throughout our region to markets across North America and around the world,” Mayor Barrett said. 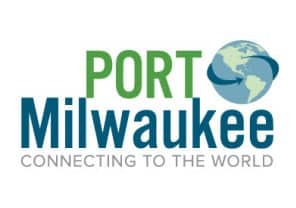 “With our new name and logo, we are reinforcing the importance of Port Milwaukee to our hometown.” In the new logo, the streamlined name, “Port Milwaukee” is presented in a modern typeface in the colors of green and blue. A stylized globe and the tagline “Connecting to the World” complete the logo. Tina Klose, a designer and marketing professional with the City of Milwaukee, worked with Port staff and the Board of Harbor Commissioners to complete the new logo. It will be rolled out on signs and marketing materials in the coming weeks. Port Milwaukee is an economic entity of City government governed by the seven-member Board of Harbor Commissioners, a panel appointed by Mayor Barrett and confirmed by the Common Council. It administers operations on the 467 acres that make up the Port and oversees Foreign Trade Zone No. 41. It promotes shipping and commerce throughout the region by providing access to domestic and international ships, two Class 1 railroads, and over-the-road transportation.